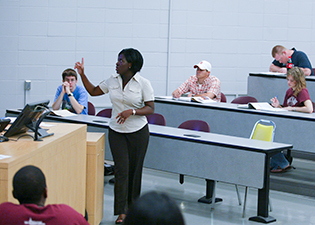 Mavis Adjei, chair of the marketing department and an associate professor of marketing, lecturing to students enrolled in Marketing Management. Our faculty members are heavily involved in noteworthy research – and, as a result, they are frequently cited and consulted as experts in their respective fields. Research changes business theory, as well as the understanding of how key business concepts and relationships work. Our students have an advantage to learn from faculty members who participate in research and study the latest developments and findings before the information is available in textbooks. Our students are better informed and prepared for a career in business because they received the cutting-edge knowledge from the researchers who discovered it. The college and our alumni support faculty members in their pursuit of knowledge creation. Together, we will change and improve the understanding of business theory, practice and education. The College of Business faculty’s research is highly recognized around the world. Thanks to the generous donation from alumnus, Ronald Smith, the faculty members can share their research through videos. The college has produced videos featuring six faculty members and has plans to continue the research – and teaching-focused series. Mavis Adjei, chair of the marketing department and an associate professor of marketing. Xiaoxin Beardsley, chair of the finance department and a Hamilton Family Faculty Fellow. Terry Clark, dean of the College of Business and professor of marketing. Greg DeYong, an assistant professor of management. John Pearson, a professor of management. Wanli Zhao, an associate professor of finance. Smith completed his master’s degree in business and his bachelor’s degree in marketing from Southern Illinois University Carbondale. In 1992, Smith began supervising the operations of four multiple-specialty medical groups, for the University of California-San Diego through a management service organization (MSO). Before the Medical Group of North County Inc. converted to an MSO, Smith supervised the operations of the multiple-specialty group, which grew from a two-doctor practice to 17 doctors. Smith also spent eight years as operations/fiscal manager of an award-winning film production and distribution company specializing in health education videos, and 10 years supervising the operations of a community health care organization. To learn more about faculty research or to watch the videos, please visit http://business.siu.edu/academics/research/.